Sometime toward the end of this year, Airbus Helicopters will test-fly what it calls the CityAirbus, a multi-passenger, self-piloted eVTOL (electric vertical takeoff and landing) vehicle designed for urban air transportation. Battery-powered, the City-Airbus will be able to take off vertically and land just about anywhere in an urban environment. According to its developers, it will go a long way to easing city traffic congestion. It is designed to carry up to four passengers over congested megacities to important destinations such as airports or railway stations in a fast, affordable and environmentally friendly way. Airbus, one of the world's leading commercial aircraft manufacturers, said the innovative four-ducted propeller configuration significantly contributes to safety and low noise. Marius Bebesel, CityAirbus' chief engineer, said, "We now have a better understanding of the performance of CityAirbus' innovative electric propulsion system, which we will continue to mature through rigorous testing while beginning the assembly of the full-scale City-Airbus flight demonstrator." The first studies on the City-Airbus started in 2015. "We were watching the rapid change in all areas driven by digitalization and new technologies such as electric propulsion, autonomous vehicles and others," Bebesel said. "We investigated how the way people travel could be affected (by these developments) and discovered the area of urban air mobility," he said. "We came to the conclusion that eVTOL could be a key to future mobility in an urban environment." Bebesel said he expected the first flight to take place sometime toward the end of this year, probably in December. "At the same time, we are working with aviation authorities to set up regulation for the certification of such vehicles and urban air mobility air traffic management. Such regulations are not in place today." 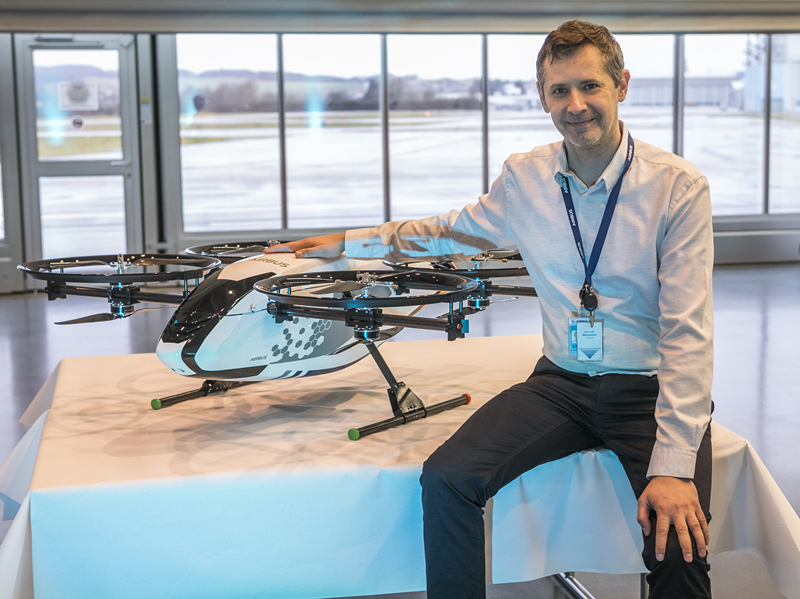 While Airbus Helicopters is just one of many companies working on flying vehicles, Bebesel said several countries are showing a keen interest in this project, although he declined to name them. Meanwhile, it is understood that China, as well as watching developments in its domestic industry, is paying attention to the CityAirbus. China is one of the world's largest operators of Airbus commercial aircraft, and the European giant has a number of joint ventures with aircraft companies in the country. Bebesel said the CityAirbus is designed to ease ground congestion, especially in cities burdened with heavy traffic as urban populations continue to expand. "CityAirbus is a multi-passenger, self-piloted, battery-powered, vertical takeoff and landing vehicle designed to carry up to four passengers on fixed routes over congested megacities in a fast, affordable and environmentally friendly way," he said. Asked whether flying vehicles are simply solving one problem while creating another in the air, he said, "We don't expect such a huge number of aerial vehicles to be operated." As to who would control the airspace that flying vehicles eventually operate in, Bebesel said: "This is one of the questions which still have to be worked out with all involved parties. Different solutions in different parts of the world are likely. "Safety, however, is of utmost importance for each aerial vehicle. Being a manufacturer of aircraft for more than five decades, we have a long track record in providing safe solutions." The CityAirbus is designed for a cruising speed of 120 kilometers per hour, with a typical one-way flight lasting about 15 minutes, or about 30 km. "This is sufficient for reaching important spots in an urban environment," Bebesel said.